Stress is a fact of life—especially during major transition times like going to college. Many factors affect your resilience. For example, your social network, how well you take care of yourself, and your overall outlook on life can all impact your ability to overcome challenging situations. It can be helpful to reflect on what aspects of your life help you weather stressful times as well as those that may be hindering your ability to manage stress. The My Resilience Factors (MRF) online self-assessment provides a quick, easy method to learn how resilient you are. In 10 minutes or less, you can complete the assessment and receive a personalized report that identifies your overall level of resilience as well as the specific factors that strengthen and potentially weaken your resilience. What if my resilience score is low? The good news is that resilience is a skill that can be developed with time and practice. 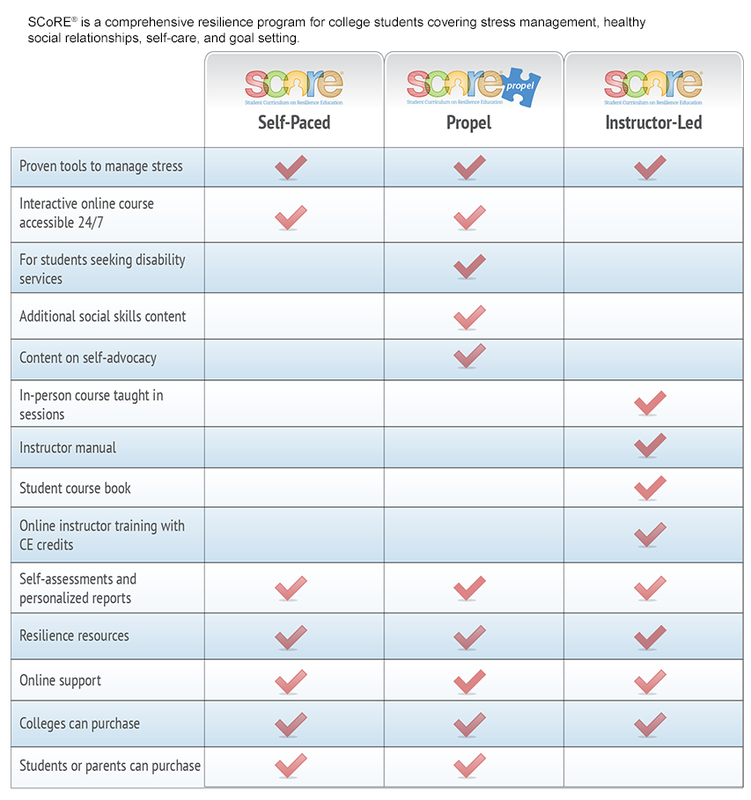 If you take the MRF online self-assessment and want to learn more about resilience, you’ll receive a 50% discount on SCoRE: Self-Paced or SCoRE: Propel. You’ll receive a discount code when you take purchase the MRF. The My Resilience Factors self-assessment is available for $9.95 for a one-year online subscription. Learn more about or purchase the MRF .